It is so important to get kids – boys and girls – loving books as early in life as possible. So that is how we’ll start, focusing on the earliest readers and the so-to-be readers. And what better way to launch a site dedicated to books for boys than with the ultimate boy book? 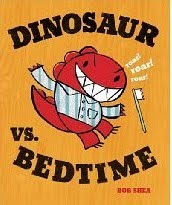 Dinosaur Versus Bedtime (Hyperion) by Bob Shea is a story that truly gets the mind of a 4 year old boy. Every boy imagines himself a superhero or a monster with a world of challenges before him. Here as a spunky red dinosaur, the main character tackles the everyday life of a kid with nothing that can defeat him. From a pile of fall leaves to the big slide, celebrates his victories until he finally must face his biggest challenge – bedtime. With simple crayon-style illustrations reminiscent of the oh-so-popular Mo Willems pigeon series, Shea brings a simple, yet energetic life to this dinosaur story. The repetitive and anticipatory text is perfect for engaging a youngster and a wonderful way to end the day for the active little explorers in your life.